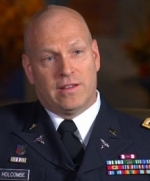 [Lt. Col. Philip Holcombe] So how do we overcome stigma? We need a cultural shift. A cultural shift that has healthier messaging. We need to get away from the message that says, "Only the weak have psychological problems." Those messages are harmful. We have to get away from those messages. We need to switch the message to "People who seek psychological health are the kinds of people that have the kind of courage needed to foster the kind of resilience needed to be able to tolerate the kinds of trauma that life brings." We have to change the messaging. We need to get it so that going to see a psychological health psychiatrist, social worker, behavior health providers of varied sorts, is not any different than going to see your physician for your annual checkup. The military is working to do that. It's really, really striving to put behavioral health providers within primary care clinics so that if a patient is being seen and there is a concern, you have behavioral health right there. They don't have to go to another building that says "mental health" or "behavioral health," although that may be what they need to do. How do we overcome the stigma of seeking help for psychological issues? Lt.Col.Philip Holcombe, Sir its 46 yrs without TBIx2 Care and Still going through hell. But I keep Struggling and Never Giving UP. I also have PTSD & MST. Sir reaching out for Help.